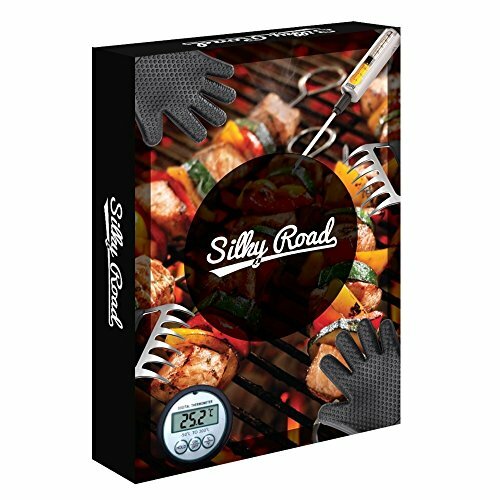 The Ultimate Set INCLUDES: TWO Industrial-Strength Sharp Metal Rubber-Grip Meat Forks/Pulled Pork Shredders, TWO Protective Oven Cooking Mitts, Heavy Duty Stainless Steel Marinade Injector with Window and 2 Syringes (large and small), Burger Press with Slider Attachment, Silicone Baster Brush, TWO Flexible Stainless Steel Shish Kabob Skewers, TWO BBQ Grilling Matts and LCD Instant Read Digital Meat Thermometer with Sheath! This enviable set really has it all! Release your inner grilling hero!!! SAVE TIME AND MONEY – EVERYTHING YOU NEED IN ONE PLACE: For the perfect smoking and meat-curing experience! Bought separately, this set would cost a fortune and take a ton of time doing research. But the quality will still lack consistency and be mismatched. Be assured, we have put together the highest quality set at the best price! Guaranteed!!! 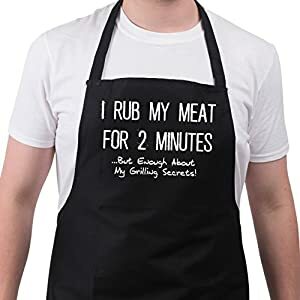 For the real meat smoker enthusiast. For all Temperatures, Recipes and Foods: Steaks, Veggies, Fish. Outdoors, Indoors, Patios, Decks, Camping. CRAFTSMANSHIP YOU TO HAVE TO FEEL TO BELIEVE! All materials in this set are certified BPA-Free, Food Grade, Easy-Clean, Professional and Heavy-Duty Crafted and resist heats at least as high as 450° F / 230° C or higher. You don’t want to be using plastic claws with piping hot meat or on the grill. That just won’t do! Our silicone gloves are inspected and tested for the highest heat resistance! This meat injector is just a bulldozer! I can go on and on – and I probably will!!! 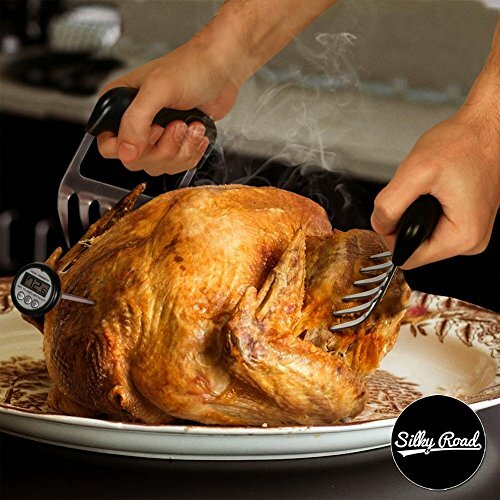 CLAWS: will effortlessly shred, lift, claw, carve and toss all types of smoked or barbecue meat, beef, roasts, brisket, turkey, pulled pork, poultry and chicken with ease! NO MORE UNSAFE PLASTIC IN YOUR PIPING HOT FOOD or OVER YOUR FIRE! Avoid all types of burning accidents in the oven, on the grill or even boiling hot pots! Commercial grade, heat-resistant, nonslip-grip, FDA-approved silicone: essential for grilling, BBQ, smoking, cooking, baking and pulling all cuts of meat. Make the most succulent meat, packed with flavor! Professional heavy-duty construction, 2-oz capacity with measuring window. Includes thick and thin needle-heads/syringes. 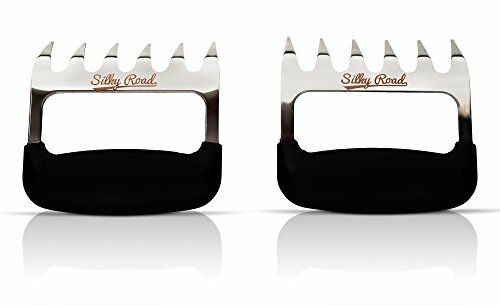 Perfectly and professionally shape the most succulent burgers or sliders: comes with an attachment for regular burgers and one for smaller sliders. Stuff your burgers with whatever fillings you like. For brushing marinades, sauce, oil or eggs on bar-b-que, cakes or bread. 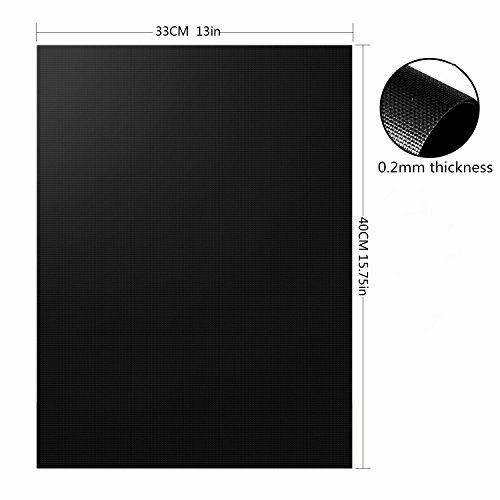 Heat resistant, food-grade silicone. 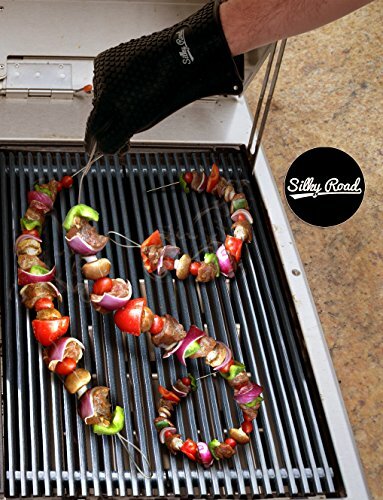 31″: Longer in length and strength: Lasts longer than regular skewers. Corrosion resistant 304 stainless steel. Easy to spool ingredients onto skewers and slide them off. Stop food from falling through the cracks of the grill – at the same time as still getting that classic grill pattern and taste! Non-stick, corrosion resistant, reusable, flexible, heat-resistant, dishwasher safe, washable. 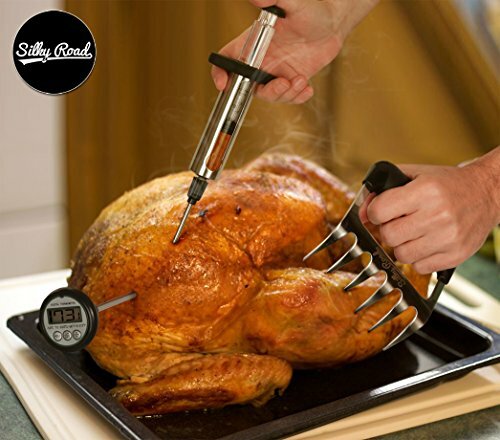 Probe measures heat up to 572° F / 300° C. Auto Shut Off and Data Memory of last measure. Includes practical sheath with clip. All the parts together add up to 18-PIECES!!! Look no further – this is the ultimate all-in-one BBQ and Slow Smoking Tool Set!!! Simply Scroll Up And Click The “Add to Cart” Button NOW! You will not regret it!!! GUARANTEED. 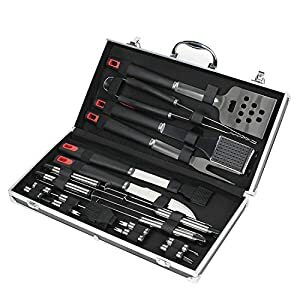 The Ultimate Set INCLUDES: TWO Industrial-Strength Sharp Metal Rubber-Grip Meat Forks/Pulled Pork Shredders, TWO Protective Oven Cooking Mitts, Heavy Duty Stainless Steel Marinade Injector with Window and 2 Syringes (large and small), Burger Press with Slider Attachment, Silicone Baster Brush, TWO Flexible Stainless Steel Shish Kabob Skewers, TWO BBQ Grilling Matts and LCD Instant Read Digital Meat Thermometer with Sheath! This enviable set actually has it all! Release your inner grilling hero!!! CRAFTSMANSHIP YOU TO HAVE TO FEEL TO BELIEVE! All materials in this set are certified BPA-Free, Food Grade, Easy-Clean, Professional and Heavy-Duty Crafted and resist heats at least as high as 450° F / 230° C or higher. You do not need to be using plastic claws with piping hot meat or on the grill. That just won’t do! Our silicone gloves are inspected and tested for the highest heat resistance! This meat injector is just a bulldozer! I will go on and on – and I probably will!!! 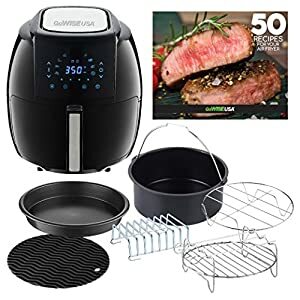 MANY USES: This Meat shredder can do anything from rugged meat shredding, to gentle burger flipping to even salad tossing! The gloves can handle being dipped into a boiling hot pan or pot in the kitchen – to opening a tough jar of pickles! Use the burger press to stuff those burgers with cilantro, onions, mushrooms, cheeses! Grilling mat can easily be used in the oven too! 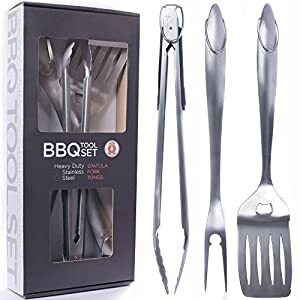 In sum, this set can entirely replace the conventional spatula and tongs BBQ set! GET. THIS. SET. You’ll not regret it. In reality: We have a 100% RISK-FREE GUARANTEE: Here at Silky Road, we do vigorous quality-control checks and personally use the items we make, so we know how well-crafted and robust the items are! We are passionate about our items! In a different way, we wouldn’t sell them. 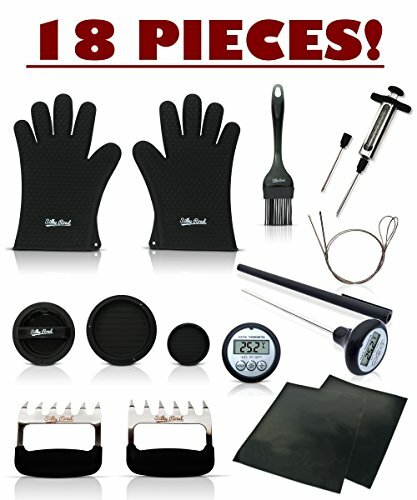 So get the Ultimate All-in-One 12-piece BBQ Tools Set and check out it out for yourself! If you aren’t satisfied with the insanely professional quality, thanks to our 30-day money back guarantee, you’ll get a full refund.